Bell ringers--including BG's Dave Feldman (white shirt) and County Councilmember Roger Berliner (center, with jacket and green cap)--open the Bethesda FreshFarm Market, June 19. One week ago today, Bethesda Green’s Executive Director, Dave Feldman, was part of a group of people who rang the opening bell(s) for the new Bethesda FreshFarm Market, June 19. 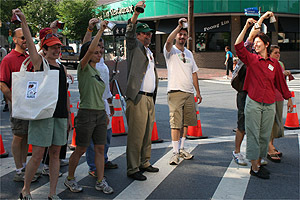 The bell ringers walked the length of the one-block farmer’s market on Norfolk Ave. FreshFarm employees, Bethesda Urban Partnership representatives, County Councilmember Roger Berliner and Feldman were among the group. 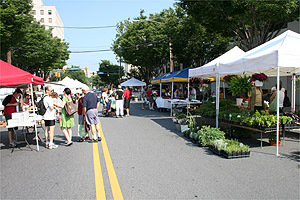 The Bethesda FreshFarm Market is open Saturday mornings on Norfolk Ave. The Bethesda FreshFarm Market is open Saturdays from 9:00 a.m. to 1:00 p.m. through October 30, on Norfolk Street, which is blocked off at that time between Fairmont Ave. and St. Elmo Ave. 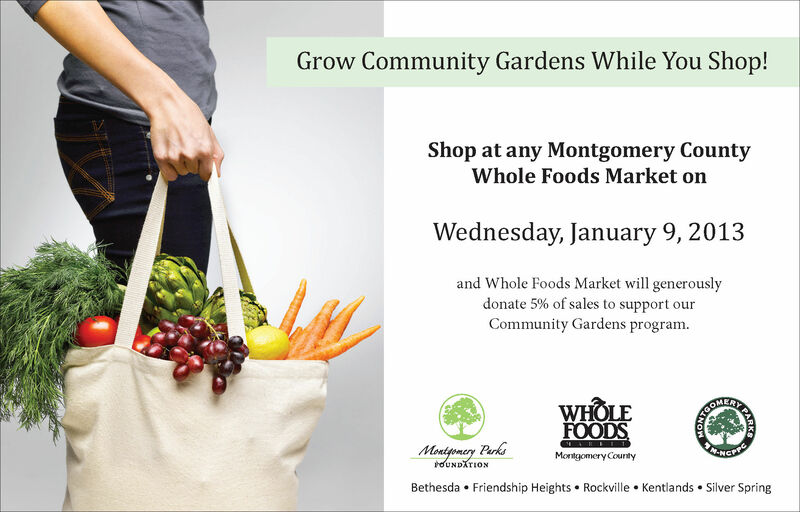 It features farmers and producers selling local fruits and vegetables, baked goods, cheese and dairy, meat and eggs, and flowers and plants. There’s even one stand that sells nothing but pies. Some vendors were not present at the opening, but there were placeholder signs noting that they would be joining the market soon. 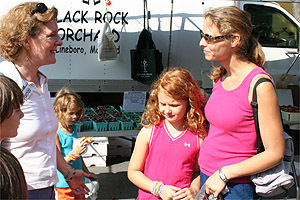 Ilaya Hopkins, left, speaks with shoppers at the market. Hopkins is a Democratic candidate for county council in District 1. A decent crowd showed up the first day. One of those perusing the produce was Ilaya Hopkins, Democratic candidate for county council in District 1. Hopkins sits on the Bethesda Green Board of Directors, as does incumbent District 1 Councilmember Berliner. The new FreshFarm market gives Bethesdans another opportunity to conveniently buy local foods, along with the Bethesda Central Farm Market that is open Thursdays and Sundays on the Bethesda Row side of town. We enjoyed a great Happy Hour March 4 at Flanagan’s Harp & Fiddle, courtesy of proprietor Mac Tigue, who not only donated 15 percent of sales to Bethesda Green, but at the last minute also offered free dinner for two for raffling. The featured speaker was BG Board Member and District 1 Montgomery County Councilmember Roger Berliner who announced that the Home Energy Loan Program (HELP) was coming in the next few months. The HELP program offers homeowners a low-interest loan for energy-related home improvements, payable through property taxes. Our group was in a lively mood, in keeping with the pre-St. Paddy’s theme, including a contingent from Capitol Office Solutions, a Xerox company and Bethesda Green sponsor, who were in town for a product show earlier in the day at our office. Since launching our First Thursday Happy Hours last fall, the events typically attract at least 50 attendees, with a large percentage of newcomers interested in learning about upcoming events and activities and connecting with others in green businesses.